All rooms at Tiny Taladnoi Hostel are air-conditioned. The private rooms feature an ensuite bathroom with free toiletries and a hairdryer. For dormitory rooms, each sleeping space comes with a private curtain, a personal reading light and locker. Shared bathrooms are separated between men and women, are fitted with free toiletries and hairdryers. Guests will find a shared lounge with TV, shared kitchen and comfortable seating area. CCTV cameras and key card access to the rooms are provided in the property for high security. Laundry, daily maid services and luggage storage are all offered. Tiny Taladnoi Hostel was a fantastic place to stay in Bangkok! We stayed one night and came in on a late flight, but there was someone at reception waiting for us and ready to check us in. The room was clean, quiet, and had all necessary amenities, and everything in the property is new and well kept. In the morning the hostel owners served a large spread for breakfast and helped us arrange a taxi to the airport. Everyone at the hostel was friendly and so kind. Would absolutely recommend! My first hostel on my south east Asia trip and it was perfect! The staff are lovely, very welcoming and friendly. It’s very clean.. toilets and showers are great. Small communal kitchen with everything you might need. Breakfast provided is toast/toasted sandwiches/ lots of fruit and tea/coffee. Oh and the beds are very big and comfortable! With a curtain for privacy which I loved. Thank you so much, would definitely return! As a couple we loved staying here. The staff go above and beyond to help you with anything. The breakfast was great. Stayed in a 8 room mixed dorm, very clean and the bathrooms were spotless. Returning here in 2 weeks time. 10 on 10. All the facilities plus the behavior of the staff was astounding. I experienced a very comfortable stay for two nights and three days. They were v. polite, caring and kind. In fact, the lady packed a breakfast for me which I left due the arrival of my taxi in the early morning. On a note, you can arrive early or later than check-in time. Since they mentioned 2 p.m. but it can vary. Also the breakfast was free. Fruits and muffins were always present on the table. I would highly recommend this hostel. The beds are super comfy. Lockers are really big. Showers and toilet very very clean. The staff were so friendly and really keen to offer help. Delicious breakfast. Good location but a little out so had to get taxis - but they were cheap! Defo stay again! We had a great experience here! Everything is so clean and nice! Water bottles are stocked in the room every morning and there is a kettle with packets of tea and coffee. They even thought of putting flip flops in the lockers for the showers. The owner is great! She goes above and beyond to make sure you are enjoying your stay. She will great you in the kitchen area every morning with a smile and make sure you have a little bit of everything for breakfast :)! Very enjoyable! We stayed in a private room here which was one of the nicest I've ever stayed in in a hostel. Incredibly clean facilities and a pretty spacious twin room. The only drawback was when we tried to extend our stay, they were booked up! The staff is very nice as well as the property, but there is not a lot of things to do in the area. 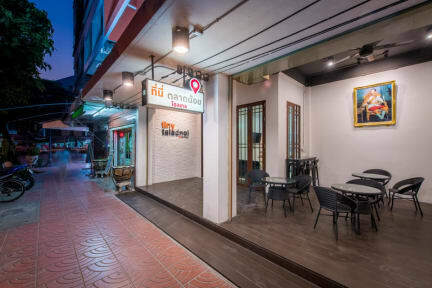 It is very far from the main attractions of Bangkok, like the Grand Palace and Khao San, but it is a nice place to go to a less touristy part of town. It is close to Chinatown, however. 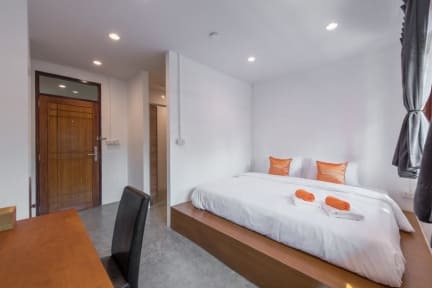 The rooms are clean and have air conditioning for whenever you are in the room, which is very good, as you won't find that in many hostels that turn it off during the day.